Whenever I ask Rob what he wants for dinner, is answer is almost always, “Asian”. He rarely requests a specific dish, just that type of cuisine. While I love Asian, most nights it’s not my go to because it requires more ingredients and chopping than some other meals. Asian takeout is known for being salty, oily and full of MSG, but when you make it at home, it can be insanely healthy! 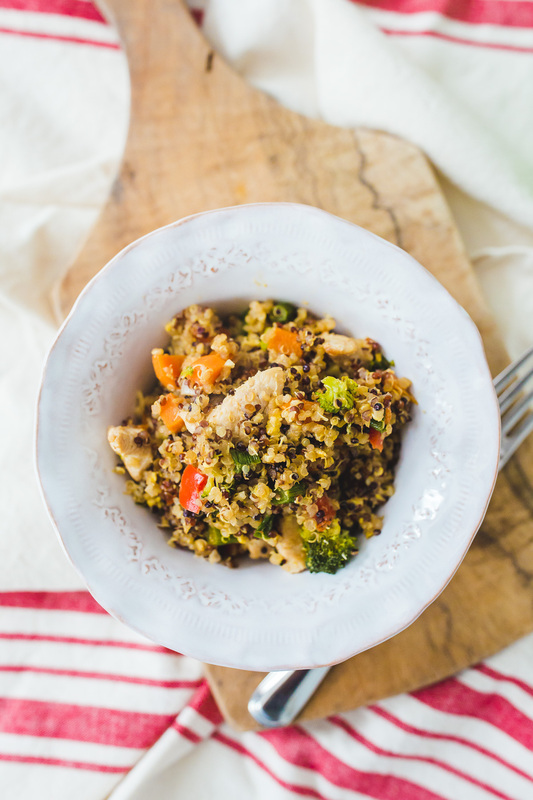 We add tons of vegetables, a bit of lean protein, and a grain that’s gluten free like brown rice, rice noodles, or in the case of this dinner, quinoa. No, quinoa is not traditionally used in Asian cooking, but I like to switch it up! Plus, quinoa cooks a lot faster than brown rice, so it’s a perfect stand-in for quick weeknight dinners. While I love making elaborate dishes here and there, let’s be honest, I rarely have the time or energy these days! So, let me know what you guys think of recipes like this! My goal is to make them simple—10 ingredients or less, easy to prep and easy to cook. Most of the ingredients are pretty standard items too, so you won’t have to go to some specialty store to find them. Another thing I love about this dish is that you can prep all the ingredients earlier in the week and just have them sitting in the fridge, ready to throw in the pan. For those of you who like to meal plan, add this one to your weekly menu! When Rob requests Asian, this dish is the one I most often cook. I typically have all the ingredients on hand and since you can substitute the veggies for whatever you have, it’s really versatile! Heat a drizzle of olive oil over medium heat. When hot, add chicken, cook until cooked through. Remove from pan and set aside. Add veggies and sauté for 3 minutes, until tender, but still crisp. Add garlic and ginger and cook another minute. Turn up the heat and add quinoa and chicken. Stir to combine. Make a well in the middle and crack egg into pan. Use your spatula to scramble. Stir the egg until it’s mostly cooked, then mix the entire pan so everything is evenly combined. Add scallions, soy sauce and sesame oil, mix again and serve hot. What healthy weeknight meals are on regular rotation in your house? BTW, spiralized zucchini salad, and mediterranean barley salad.